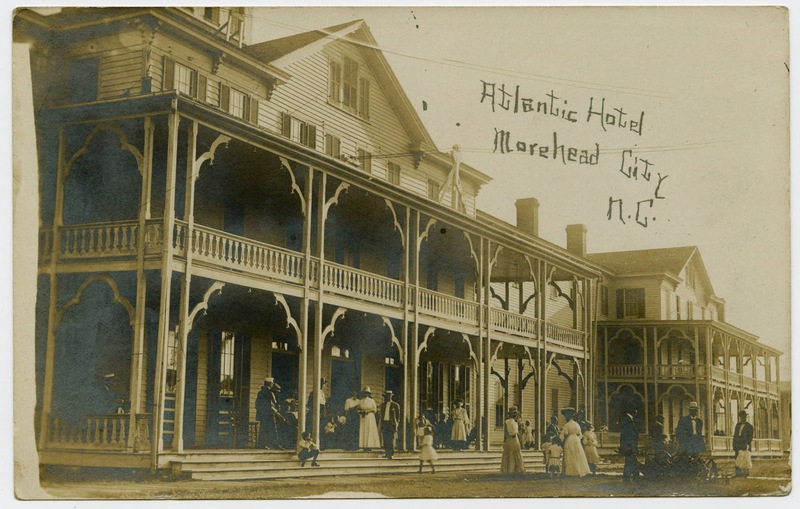 The building of the Atlantic Hotel in Morehead City in 1880 had an incredible impact on the city's economy. The area became known as the "The Summer Capital by the Sea." and created many jobs and opportunities for those who lived nearby. One of my Jones ancestors may have worked at the Atlantic Hotel. For certain, I know that the husband of my 2nd great grand aunt was affiliated with the establishment. Here are my Jones ancestors listed in the 1880 census for Morehead City. 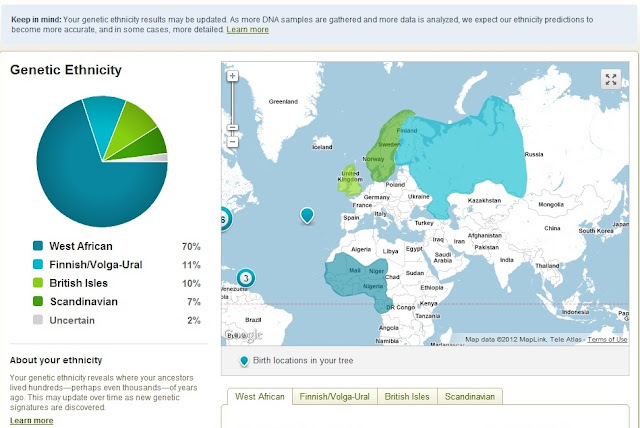 Image courtesy of Ancestry.com: Source Information: Ancestry.com and The Church of Jesus Christ of Latter-day Saints. 1880 United States Federal Census [database on-line]. My 3rd great grandfather Cesar Jones was a farmer in 1880 while his wife Mary worked in the home. His children, William Henry, Lizzie (Elizabeth), and a nephew, John Carter, were listed as laborers, perhaps working on Cesar's farm. In the next household, resided Violet Jones Devaughn, my 2nd great grand aunt, who's occupation reads "cook in hotel." Could this have been the Atlantic Hotel?" 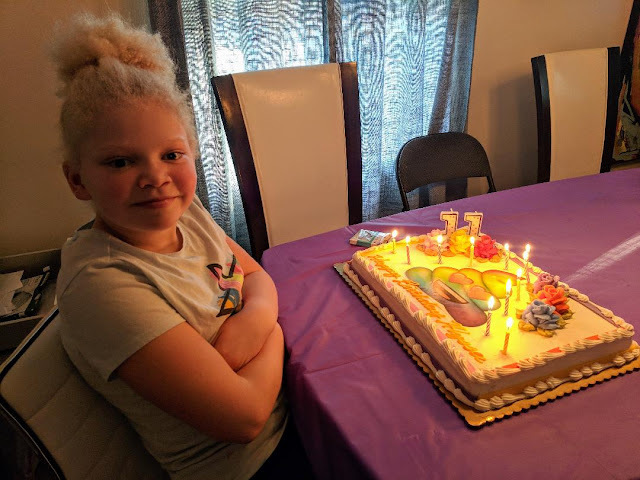 My 2nd great grandmother, Jonas Bryant, had a sister named Sidney. Sidney Bryant married a man by the name of Mott Hester. Now this part makes my husband chuckle. The reason why is that he can't believe how often I have come across information regarding some of my ancestors in books or articles. I can't believe it either sometimes. A couple of years back I ordered a lovely book written by Virginia Pou Doughton called, "Tales of the Atlantic Hotel 1880--1933." It is a fabulous resource that tells year by year what it was like to reside at the hotel. There's tales about the guests who stayed there as well as stories about some of the folks who worked at the establishment. Well amazingly enough there's a small section about Mott Hester in this book and it even includes a picture! Captain W. L. Kennedy was such an ardent fisherman that he purchased a boat, the India, and hired a permanent captain Mot Hester. 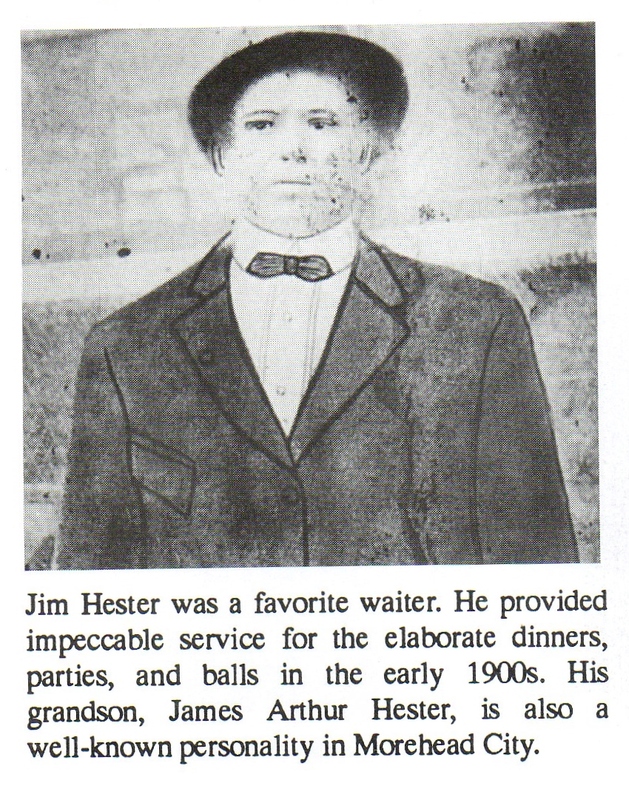 The Hester family had come from Jamesville, North Carolina, to fish in Carteret County a number of years before. Images courtesy of the book "Tales of the Atlantic Hotel 1880-1933"
by Virginia Pou Doughton, page 40. Mott was not the only Hester mentioned in this book. In fact, Mott's nephew Jim is mentioned on another page. 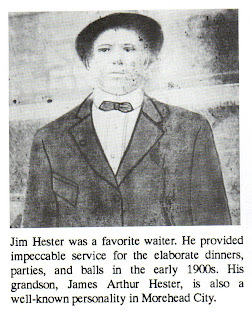 Jim Hester was the son of Mott's sister, Nannie. 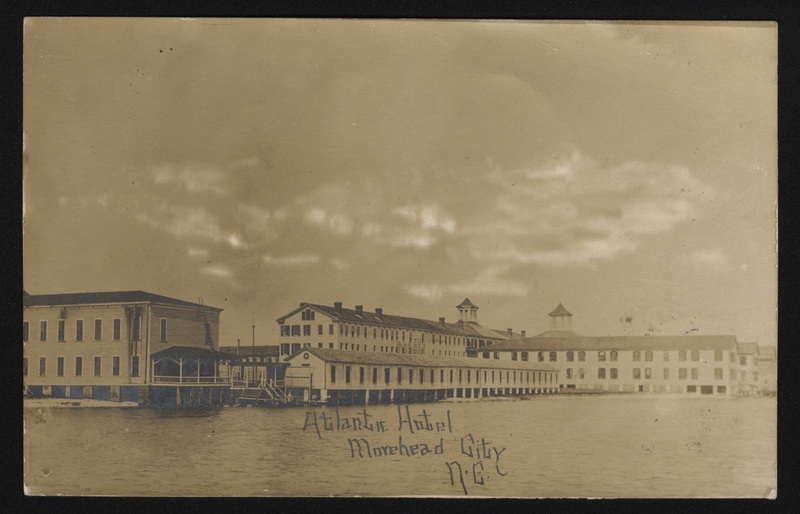 Image courtesy of the book "Tales of the Atlantic Hotel 1880-1933,"
In fact, Virginia Pou Doughton wrote a book prior to this one titled, "The Atlantic Hotel." This book tells the tale of the hotel when it was in Beaufort, Carteret, NC from it's creation in 1859 until it was destroyed by a storm in 1879. In that book she mentions the heroics of certain individuals on the night of the storm. The Hester brothers from Morehead City were in Beaufort at the time of the tempest and they helped many guests reach safety. That family continues to produce descendants of character and decorum as is seen in James Arthur Hester at the Morehead City Yacht Basin and in Alice Hester Walker of the Coral Bay Club. The Hester brothers she referred to in this book, I believe may have been Mott Hester's older brothers, Benjamin and John. Your ancestors made their mark on the Atlantic Hotel and the entire area, and it's only just that a book should have been written with them as characters. I love the two pictures, and Mot Hester looks like a seaworthy boatman. Stories galore. And you often find ancestors in books or articles? Intelligence combined with luck! Thanks Mariann. If I could only go back in time to take a boat ride with Mott. He looks like someone who had many an interesting tale to tell. You have found wonderful treasures. I guess that is why I try to read anything written about the area my ancestors came from, hoping to find something, anything about the ancestors. I know what you mean Linda. Even the tiniest piece of information can mean so much. 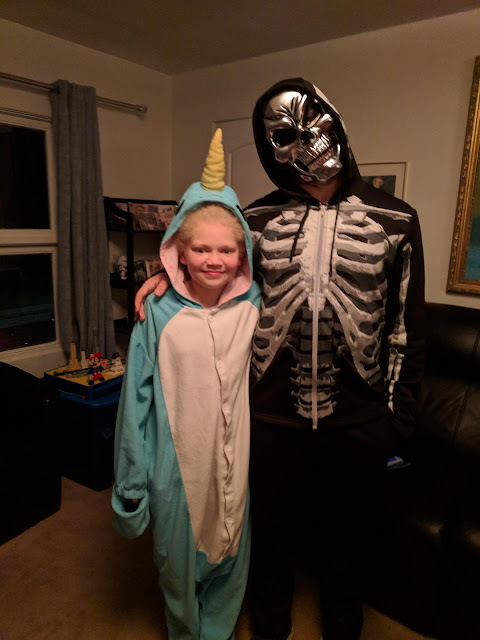 I tried posting this earlier, looks like it didn't go through. Have you seen the Great Hurricanes of North Carolina book on Google Books? See http://books.google.com/books?id=LbHmjcbSx6sC&pg=PA72, discusses the Atlantic Hotel.